It is the genuine tyre, it has been tested for 10 years under all type of working conditions, which assures a reliable and safe product. Its main characteristic is its low cost/benefit. It bears the heaviest loads while offering high stability, excellent wear and puncture resistance to forklift and the industrial material handling equipment. A. Wear and tear resistant compound help prevent chunking and chipping extent service life. B. Special tough natural rubber compound for low heat built up result in cooler running tyre. 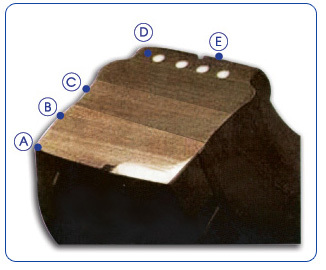 D. Bead ring reinforce increase structural strength an ensure high load carrying capabilities. E. Base rubber with steel bead ring help prevent slippage with rims.